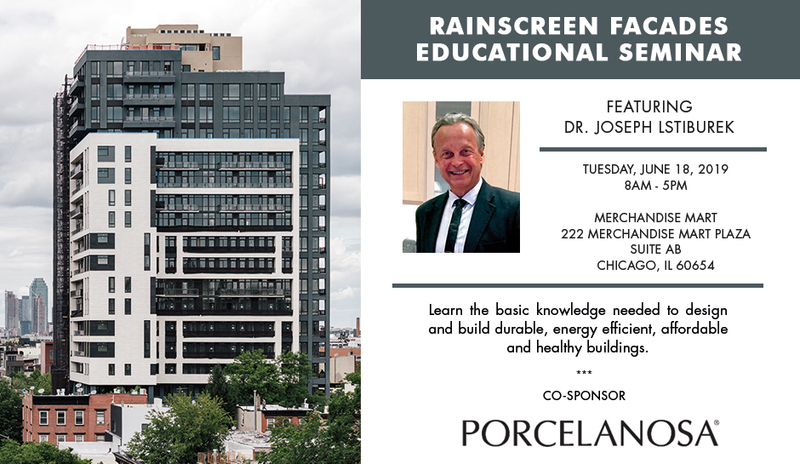 Earn 8 AIA credits by attending the Rainscreen Facades Educational Seminar featuring Dr. Jopseh Lstiburek on June 18th. Learn the basic knowledge needed to design and build durable, energy efficient, affordable and healthy buildings. Dr. Joseph Lstiburek will discuss building science principles (such as the control of heat, air and moisture and IAQ) and show you how to apply them to low-energy enclosure design, advanced HVAC systems, forensic investigations, and the repair and retrofit of existing buildings. Dr. Lstiburek is the founding principal of Building Science Corporation. The Fundamentals class has been attended by over 1500 builders, architects, engineers, building science consultants, building code officials, facility managers, building product manufacturers and government officials. The $95 attendance fee includes breakfast and lunch, but does not include travel or accommodations. The course is valued at over $800!